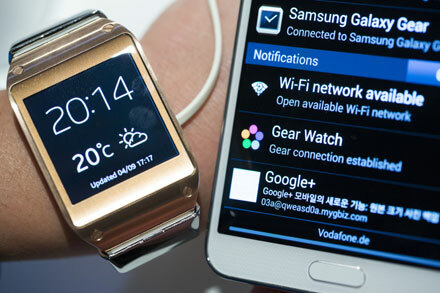 Samsung unveils many new products, including the highly anticipated Samsung Galaxy Note 3, Gear smartwatch during IFA Berlin 2013. Galaxy Note 3, which has a 5.7 inch Super-Amoled screen will weigh 168 grams. The device will be available in 140 countries from September 25 starting at price tag of $860 and the worldwide availability will be from October. The phone will be available in jet black, classic white, and blush pink color options. “For the first time we have given Galaxy Note 3 a warm texture-touch cover,” claimed Samsung. “It is slimmer, lighter, and more powerful. All in a beautiful design, JK Shin, President & CEO Head of IT and Mobile Communication Division at Samsung Electronics said. The Note 3 also boasts of a multi-window feature. T his is Samsung’s option that allows you to have two apps side by side. This functionality also allows users to drag content from one app to another. Samsung also showcased additional features to its S Pen stylus for the Galaxy Note 3. Samsung showcased a new Air Command menu on Note 3, with Action Memos, S Finder, Scrapbook, and Pen Window. The S Note app on Note 3 is meant to the user to write, edit and view anywhere, said Samsung. The S Note app also syncs up with other apps like Evernote. The device was unveiled at the event ‘Samsung Unpacked 2013’. The launch comes as a part of the IFA consumer electronics fair. Shin started the event by saying that the company launched a whole new category with the first Galaxy Note, back in 2011. 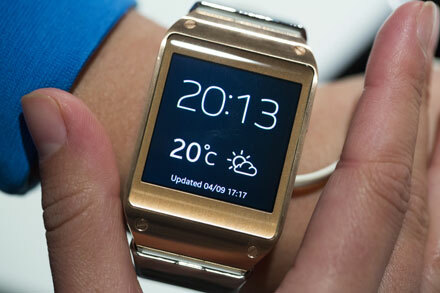 Samsung also showcased the Galaxy Gear watch. “Smart freedom. Perfect companion to Galaxy Note 3,” Shin said. The Android-powered device starts shipping in most countries September 25 starting at $299. It will be compatible initially with two Samsung products also unveiled Wednesday _ the Galaxy Note III, which is a smartphone with a giant 5.7-inch screen and a digital pen, and the Galaxy Tab 10.1, a tablet computer with a 10.1-inch screen comparable to Apple’s full-sized iPad. The South Korean electronic giant believes its Galaxy Gear watch will lead a new trend in smart mobile communications. “We are confident that the Gear will add meaningful momentum to the mobile industry,” the head of the group’s mobile business, Lee Young-hee told the Korea Times in a recent interview. It will be compatible initially with two Samsung products also unveiled Wednesday _ the Galaxy Note III, which is a smartphone with a giant 5.7-inch screen and a digital pen, and the Galaxy Tab 10.1, a tablet computer with a 10.1-inch screen comparable to Apple’s full-sized iPad. With smartphones and tablets now ubiquitous, electronics companies are trying to create a new category of products to lure consumer spending. That includes building advanced computing technology into everyday objects such as wristwatches and glasses. Apple Inc. has invited Chinese journalists to an event in Beijing on September 11, just hours after it is widely expected to unveil its newest iPhone models in the United States, Chinese media reported on Wednesday. The event would mark the first time that the company has held near-simultaneous briefings in the United States and in China, the world’s biggest mobile phone market where Apple Inc. has been losing its star power to rivals like Samsung Electronics Co Ltd. The event has fuelled speculation that Apple Inc. may announce a long-awaited deal with China Mobile Ltd, which is the world’s biggest mobile phone company by customers and the only one of China’s big carriers that does not have an agreement with the US tech giant. For Apple Inc. gadget lovers the month of September holds out much promise, not just for those who willingly pay top dollar for the company’s pricey gadgets, but also for those who covet the iconic products even though they can’t really afford them. But first things first. Apple Inc.’s much-touted iPhone 5S’s launch is set for September 11, according to reports. Fingers crossed. Secondly, for the budget conscious, iPhone 5C (less feature rich, but affordable) is scheduled to go on sale latest by September 20. The date holds true also for iPhone 5S. Thirdly, according to a tech blog, Apple Inc. is rolling out the final version of iOS 7 on September 16, while ‘Apple iOS7 Golden Master’ release is tipped to be out on September 10. Earlier, iPhone 5S and iPhone 5C were reported to start shipping in October. And, speaking of October, according to the blog, Apple Inc. is preparing for a second big media announcement on the launch of iPad 5 and iPad Mini 2, which are expected to go on sale in the same month. Whether intentionally or otherwise, Apple Inc. has kept interest alive in iPhone 5C and iPhone through timely leaks via ‘images and videos’. Sadly, the updated lineup will also mean the death of the iPhone 4, released first in 2010, But it has its pros and cons, of course. Experts believe that ‘iPhone 5C’ can replace both iPhone 4S and iPhone 4, simply because Apple Inc. wants its entire iPhone lineup to feature large 4-inch displays and a new lightning connector, completely removing the legacy 30-pin connector from existing lineup. Considering that design and colour play such a huge part in Apple Inc.’s work culture, the company may follow, for iPhone 5S, the trend in booming Chinese (Asia-Pacific region) handset market whose colour preference is trending toward gold and orange – the ‘champagne’ colour which has taken the tech world by storm. Apple’s newly revamped iPhone lineup is expected to include the high-end ‘iPhone 5S’, a plastic ‘iPhone 5C’, and a low-end option with the legacy iPhone 4S, according to media reports. Apple iPhone 5C is expected to include mostly the same components as iPhone 5, including an A6 processor and a 4-inch Retina display. The tech major is expected to cut costs and boost margins by featuring a plastic rear for the device, which is likely to come in a variety of colors as per various ‘leaks’. iPhone 5S is, however, expected to become Apple’s new premium smartphone, featuring same metal construction as iPhone 5, but sporting a fingerprint sensor beneath the home button as well as a dual LED flash component for better low-light photos. Hiya. I came across a person’s weblog making use of ask. That may be an exceptionally well crafted document. I’ll be bound to take note of that and are avalable back to know more of this helpful information. Thanks for the write-up. I am going to undoubtedly come back.